In order to upgrade their second first round pick five places (they also have pick 10), Port have given up two second rounders (if we call the third rounder and future third a wash). This is early GWS fire sale country. There has to be an ulterior motive. The easiest one to see is that there are three young South Australian players tabbed to go inside roughly the first 8 live picks. Having consecutive picks at 10 and 11 would likely see the Power miss out on all three, and be forced to either stretch for the second tier of Croweater talent, or pick players from outside the borders of the Festival State. Clubs in Perth and Adelaide have become more concerned about the dreaded “go home” factor with players wishing to return to (mostly Victoria), which leads to them placing an extra premium on highly talented locals. This trade means that (assuming four of the early selections are Smith, Walsh and the King twins), they will get a chance to pounce on at least one of Lukosius, Rankine and Rozee as they slide to pick 6 – most likely the latter. It will also leave Port a fair chance of snagging Hately at 10, although there are other local talents that will be hanging around the mid to late parts of the first round. But that’s a lot to give up for such a small move. The Power are essentially giving up the value of a pick 11 for free, in order to move up fairly slightly. Picks 11, 23, 30 and 49 constituted a pretty good draft hand, and we’ve written before about the value of multiple slightly lower selections versus one higher one. This shows how sold on Rozee the Power must be. It’s also worth noting that Port currently have 36 players on their senior list right now, with Dan Houston a potential rookie upgrade candidate. 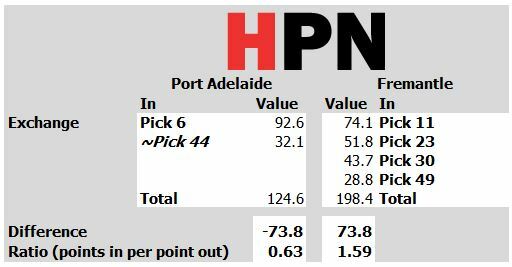 With a max of 40 players on the senior list, Port would have had to make tough calls on cutting existing players to even use that pick 49. However, after this trade their current third pick sits at 85 – which one would suggest that they will go with two draftees in a super strong class. Or, perhaps Port will make further moves to move back into the draft – a tougher task without all of this draft capital. It is worth noting that Port have recent history in staking out some pretty extreme and unorthodox draft positions. Last year they vacated the early part the draft to take nothing but five speculative picks between 47 and 61. In 2016 they swapped picks with Gold Coast, Brisbane and Sydney, giving up pick 9 and a future first rounder to move back later in the order and take four picks inside the 2016’s top 30, including Todd Marshall and Sam Powell-Pepper. It seems they’re at it again. Verdict: Freo are big winners here.